If you plan to do business at Kye's, we have the tools and technology to make your time here efficient and productive. Studies have shown that business meetings conducted away from the office, in an atmosphere conducive to communication, are more PRODUCTIVE and ENERGIZING for those involved. That is precisely the advantage we offer those who choose us for their important meetings. With our complete event planning capability and flexible space configurations, you can CONCENTRATE on the task at hand. Our COMPLETE EVENT PLANNING SERVICES can assist you in focusing on the purpose of your meeting. Availability of audio visual equipment and public address systems make communicating easy. At Kye’s, your business is our PLEASURE. 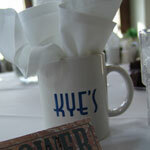 Kye’s I and Kye’s II offer a location as UNIQUE as your special event itself. All gatherings take on new possibilities because of our ONE-OF-A-KIND ARCHITECTURE and setting. Connected by a spacious tent-covered courtyard, with DISTINCTIVE WROUGHT-IRON enclosure and a lovely BLUE-TILED FOUNTAIN, the two buildings can be used together for even the largest gatherings. And because separate areas have their own AMBIANCE, your guests have options of surroundings that fit their mood, from energetic to quiet and conversational. As with all events held at Kye’s, our event planning professionals are at your beck and call. Our only goal is for your affair to be EVERYTHING YOU IMAGINE IT TO BE.